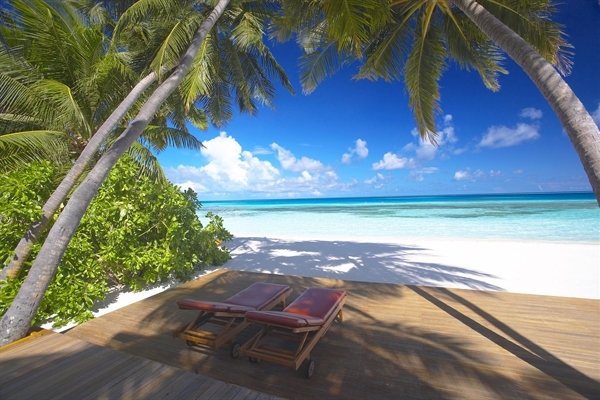 A tranquil, candid Maldivian resort ideal for honeymooners and couples. 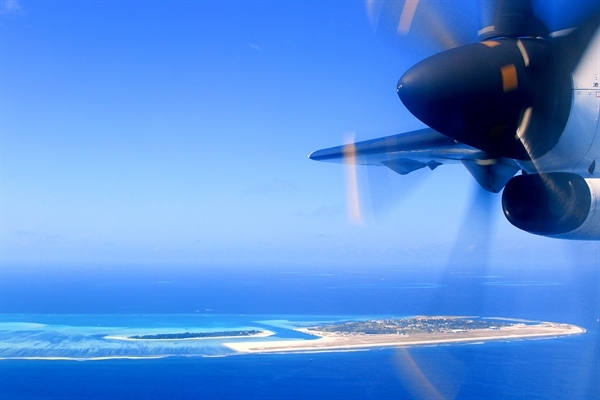 Medhufushi Island Resort is an unobtrusive, tranquil and genuine Maldivian resort established on the unspoilt Meemu Atoll just 40 minutes seaplane journey from Male international airport. 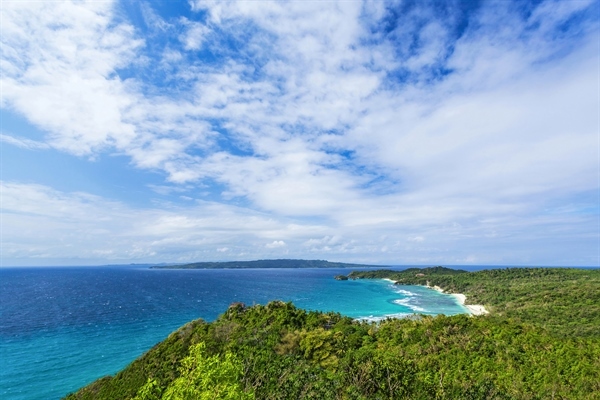 Only a small island the feeling of privacy and space pervades, the resort is popular with honeymooners and those seeking a quiet location there is however plenty of activities to indulge in including many water sports, sea excursions and the spa. 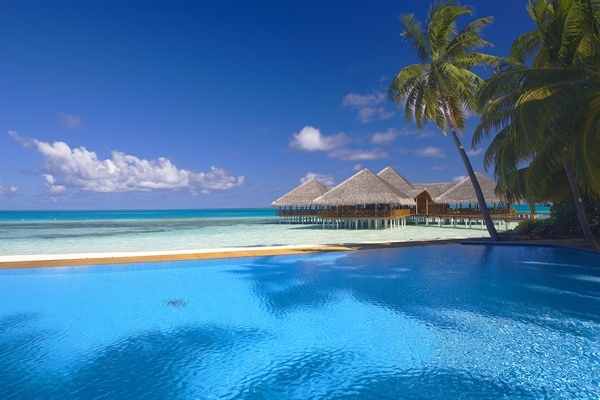 The thick green lush vegetation typical of the Maldives is surrounded by beautiful white sandy beaches and encircled by a crystal clear lagoon making it a wonderful spot to learn to dive. Medhufushi has a vibrant house reef that gently slopes down to 6 metres offering a variety of colourful marine life around large coral formations, you can easily access the 48 dives sites in the area and with mixture of easy and more difficult dives even the most experienced of divers will be blown away with what is waiting to be explored by you. 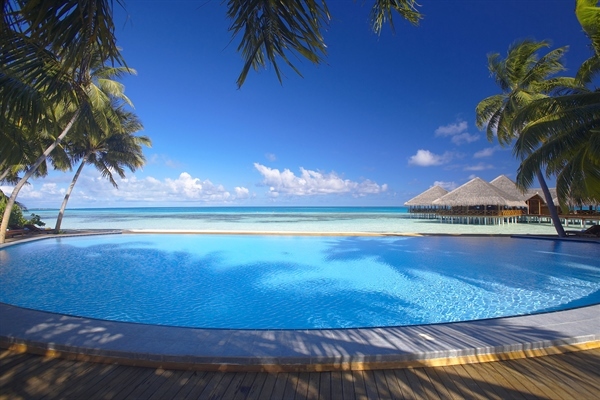 The resort consists of 112 elegant and beautifully finished villas with thatched roofs scattered around the island, some of these are built partly over the crystal clear blue waters of the lagoon. 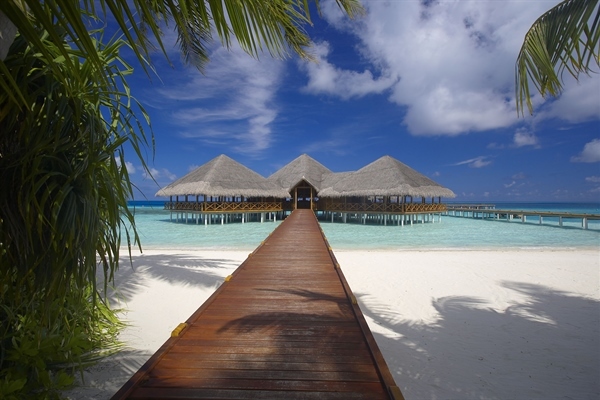 There are 14 semi-detached beach villas, 44 beach villas, 8 beach villa suites, 44 water villas and 2 lagoon suites. Dining options are aplenty, with half board, full board and all inclusive choices available in the main restaurant Malafaiy which offers the traditional buffet style breakfast, lunch and dinner with culinary delights from around the world. 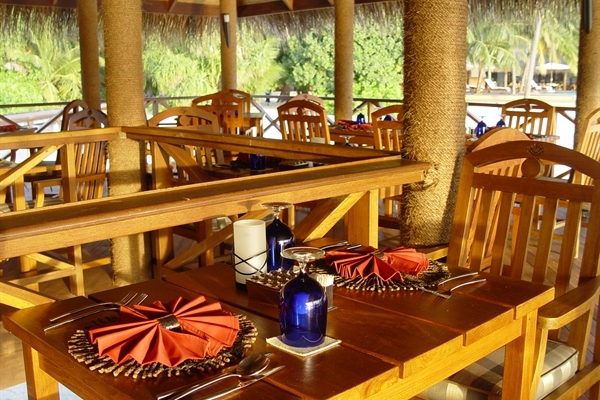 Located right next to the pool you can dine whilst gazing out over the beautiful lagoon. 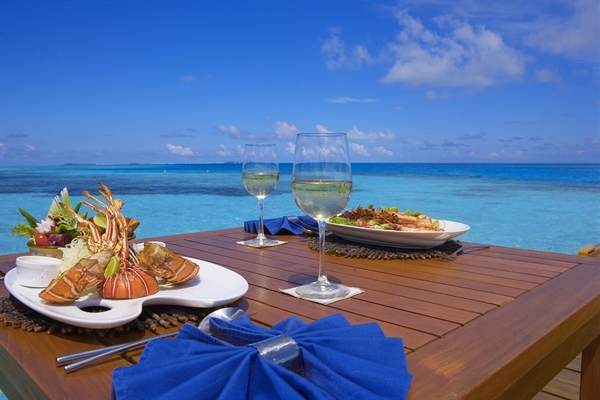 Alfresco provides an a la carte menu with a wide range of beverages in an open air setting allowing you to soak up the mesmerising sunset and for those special occasions romantic celebration beach dinners can also be arranged. The Vilu Bar is built over the lagoon offering spectacular beach and ocean views, it has a wide selection of premium drinks and cocktails as well as an extensive snack menu. Werner Lau is the on-site PADI dive school sitting next to the beautiful lagoon the experienced diver instructors are keen to share the 48 relatively untouched dive sites in the area. Many of the dive spots on offer are in and around the atoll and propose a relatively relaxing and easy dive, there are however a myriad available to the more skilled diver and the instructors will be happy to take you to the more challenging dives on the interior and exterior of the atoll. Guests will not be disappointed for example Grouper Cave is 30 minutes from the resort and offers a sandy plateau around 10 to14 metres covered in beautiful coral formations with huge schools of blues striped snappers and overhangs that drop down from 15 to 33 metres full of soft coral. On the sandy bottom you can often see sting rays hanging around! Half and Half as the name indicates is split into two halves, a wall and a sandy plateau. The wall drops from 5 to 23 metres with numerous caves and overhangs where glass fish, slugs and moral eels can be spotted. The reef then levels out to a sandy bottom where huge shoals of fusiliers, turtles and sting rays exist. There are also numerous outstanding channels to experience, including Mantas & More which is in the top ten of the Maldives channel dive sites. 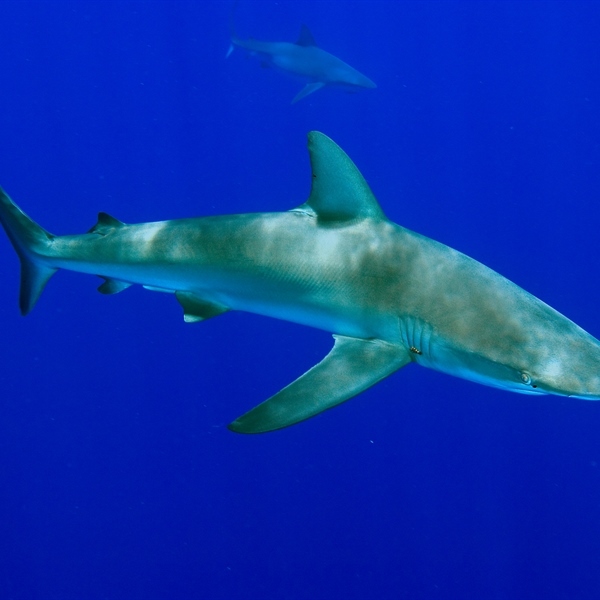 Here you can enjoy the larger pelagic such as groupers, dolphins, sharks, turtles, manta rays, whale sharks and countless grey reef sharks. The 14 semi-detached beach villas are scattered around the edge of the island and all face the beach. Wood is the main feature in these modern, simplistic yet elegant rooms, at the end of a busy day you can go out on to your veranda kick back and relax on the Maldivian style swing. 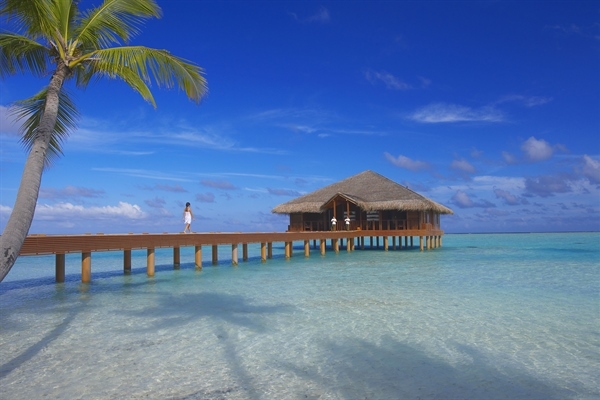 The 44 water villas are tastefully furnished, detached and built on stilts over the lagoon. Each room benefits from an amazing sunrise or sunset which can be enjoyed whilst lounging on the king size bed and watching through the feature glass fronted bedrooms with spectacular views of the ocean. The 44 detached beach villas are located around the edge of the island and all face the beach. The rooms consist of a king size or twin beds, an outdoor rain shower and a private veranda with sun loungers where you can relax at the end of a hard day of diving. The 8 beach villa suites are two beach villas joined by an outdoor seating area, ideal for friends and families they can accommodate 4 guests comfortably. Facing the beach with ocean views these spacious and luxurious suites are breath-taking. 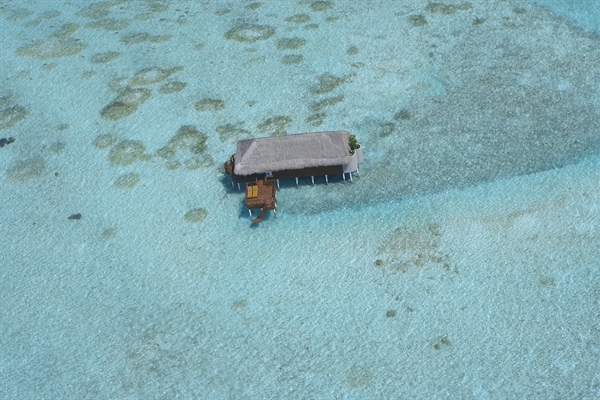 The 2 lagoon suites are built on stilts over the clear azure blue waters of the lagoon. Both have a king size bed and are spacious and elegant in design. Each has a modern bathroom with jacuzzi and an outside wooden decked area with chairs to enjoy the magnificent ocean view. The villas do not have a jetty, instead a dingy is provided as the mode of transport for the duration of the guests stay. 40 minutes from international airport by seaplane. The PADI accredited 5* Werner Lau dive centre in Medhufushi is run by a crew of 5 international, multi-lingual diving instructors who are known for their very safe and friendly service. 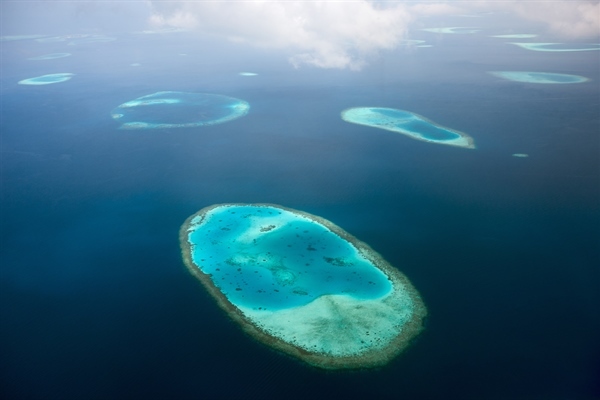 They have been working in the Maldives for many years and their knowledge and experience will give you the opportunity to enjoy some of the best diving in this part of the world. The Werner Lau dive centre in Medhufushi is run by Ingrid and Laurent who have been working in the Maldives for many years. Their knowledge and experience will give you the opportunity to enjoy some of the best diving in this part of the world. Both of them as well as their crew of international diving instructors are known for their very friendly service. This new and spaciously built diving centre has been designed by professionals to meet the specific needs of divers and is located directly on the beach on the east side of the atoll. The centre is generously equipped to the highest and most modern standards allowing you to rent all your equipment once you arrive in the centre. If you have your own personal diving equipment it can be stored in the purpose built wet room that is securely locked overnight. The centre has a fully equipped workshop so if there are any problems with equipment staff are fully trained and on hand to assist. Guests can dive the house reef at any time during the day which is located just in front of the dive centre, there are 3 diving boats (dhonies) which depart daily at 09:00 and 14:30 with oxygen and medical supplies on board and a first aid fully trained crew in case of emergencies. Werner Lau centres offer Nitrox diving free of charge for qualified divers. Night diving by boat will be offered once or twice a week and is an experience which you should not miss. 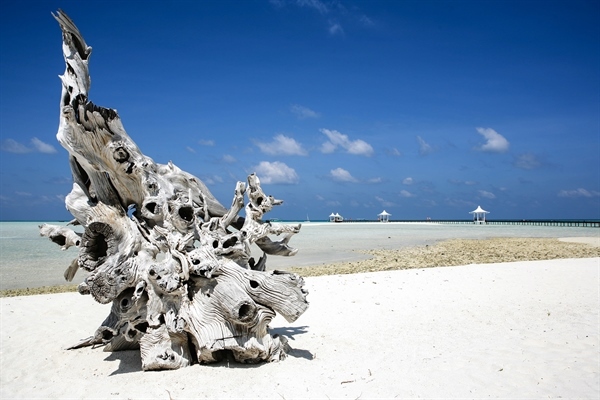 Two to three times a week day tours will be available which take you to the spectacular channel sites to the west of the atoll. The dhonies visit 2 or 3 different diving areas so you can choose the reef which is most suitable for your personal interest and diving skills.